If you were out enjoying the beautiful weather this past weekend, you probably noticed one of the less welcome signs of spring: things on our lawns are getting a little straggly, so the lawnmower’s pretty much due to come out of hibernation. If you live in one of the Nashville neighborhoods close to downtown, odds are you don’t have a property large enough for that to be too much of a headache. And it’s easy enough to hire a landscaper to take care of your wild lawn on a weekly/bi-weekly basis. But let’s say you’ve bought a new Nashville-area home that’s gotten overgrown while it was on the market, or you’re in a part of town that affords you the luxury of a big piece of land to tame. Or maybe you’re an investor who’s just purchased an weed-engulfed lot to build on. You can hire a landscaping team for any of that, too… but wouldn’t it be more fun to hire a flock of sheep or herd of goats? Totally doable: The Nashville Chew Crew is a Nashville business that delivers a flock of sheep to your property “to act like four-legged lawnmowers,” clearing out whatever overgrown area you need tended to, from five/six feet high to the ground. Franklin’s Goat Guys can do the job too, delivering a similarly hungry herd. It’s adorable, but it’s also completely logical and effective — sheep and goats have voracious appetites for greenery, and are great at navigating steep/overgrown terrain. So whatever urban jungle you’re dealing with, a Chew Crew or Goat Guys flock or herd is built (and all too happy) to tackle it. It’s not just a Middle Tennessee thing; the process is called targeted urban grazing, and it happens all over the place, with sheep, goats and other animals. But our hometown grazers are great at what they do, and getting deservedly famous around here for it. 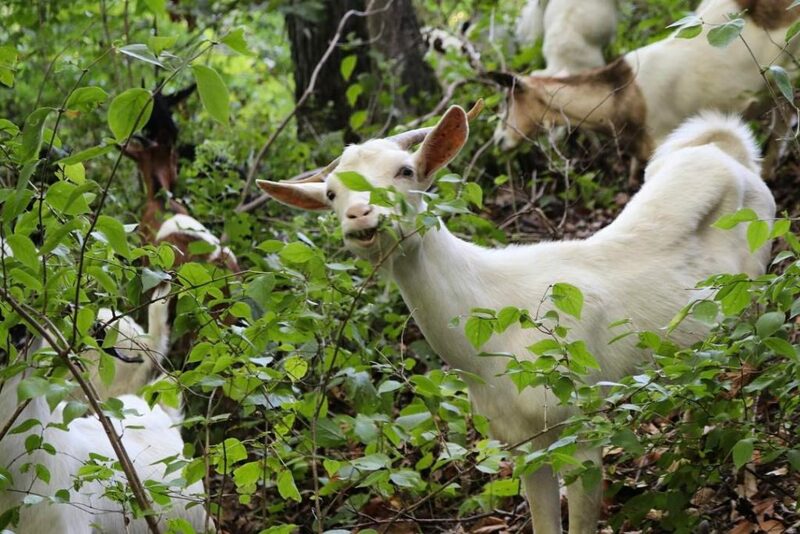 WSMV and WKRN, among others, both recently reported on Nashville Chew Crew’s work clearing Fort Negley, and Mayor Megan Barry was recently touting the Goat Guys as the city tapped their services to clear a levee around MetroCenter. The video at the top of this post is a fascinating introduction to what the Nashville Chew Crew does, but here are the basics of how the four-legged team does their work: a temporary enclosure is set up, and a flock is delivered — usually 20 sheep and two guardian dogs to protect the flock against predators. Everybody stays on site until the property is cleared, and the Chew Crew team comes by to check daily. When the work’s done, Chew Crew border collie Duggie herds the ewes back on the truck, and off they go. There are Weed Wrangle events all across town to take part in, from Belle Meade to Donelson, but the Chew Crew is headed for the one at the Cumberland River Greenway. If you want to join them there to watch them work/pitch in yourself, you can volunteer with Hands on Nashville. Volunteers (and sheep) will be working from 9 a.m. to noon. Are you on the hunt for a property big enough to hire a herd of goats to clear? Maybe something served better with a small lawnmower? We’d be happy to help with either. Contact ACRE, and tell us about what you’re looking for.